New Era Electro Service (W.A.) carries out repairs in our workshop on a variety of electrical equipment from hand held power tools to battery chargers, rectifiers, motorized pulleys, electric motors, generators and associated electrical equipment. 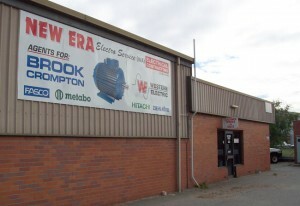 Sales, Service and Warranty repairs for Stanbury Scarf & Lord Battery Chargers, Interroll Joki motorised pulleys, Fasco electric motors, Milwaukee, Metabo and Hitachi power tools, Austech / Scorpion products, Brook Crompton and Western Electric electric motors. ABB, AEC, AEI, Asea, Atco, Atlas, Baldor, Bauknecht, Betts, Bison, Bodine, Bonfiglioli, Bosch, Brinsmead, Brook Hansen, BCB, BCP, Bosch, Boxjet, Busch, CEG, CMG, Crompton Parkinson, Dayton, Demag, Denison, Denyo, DeWalt, Doerr, Dornier, Dunlite, Eberhard Bauer, EBM, EEC, ECC, Elco, Elektrokovina, Elemac, Elephant, Elmo, Fantech, Fein, Fiberaire, Fimec, Flender, Fuji, General Electric, Girbau, GMF, Groschopp, Gruppo, Halter, Hanning, Helin, Himmel, Hitachi, Hobart, Hurlcon, Hytore, Joki, Kango, Karcher, Kew, Kirloskar, Kohlbach, Kyowa, Lafert, Lamb, Leeson, Lenze, Leroy Somer, Little King, Loher, Lombardini, Magnetek, Makita, Marathon, McColl, McPherson, Mechtric, Mercadel, Metabo, Metcalfe, Mez, Mitsubishi, Modra, Muhlacker, National, Newman, Nishishiba, Nord, OTC, Oemer, Pacific, Parvalux, Peerless Products, Pope, Positec, Powerteam, Reber, Reliance, Rita, Roto, Rupes, Rusmar, Saccardo, Sanyo, Schorch, Seeley Int, SEK, SEW, Shibuya, Siemens, WH Smith, Sodeca, Speed Queen, Sunbeam, Sweco, Syntron, Tac, Tatung, Teco, Tekaire, ThermoKing, Thomson Houston, Thrige-Titan, Tongyun, Torin, Toshiba, Toyang, Universal, Vem, Wacker, Waldown, Webster, Weg, WE, Westinghouse, Wolf, Yaskawa, Yem, Ziehl Abegg, Zmood.